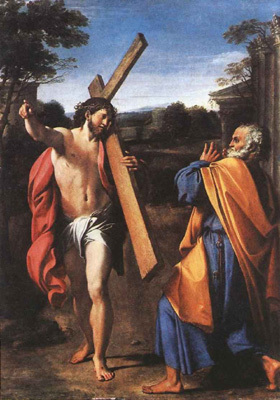 Jesus asks an on-looker if this is the way to the crucifixion. The hapless old man recoils in horror as the Savior's unsavory body odor stuns his mortal senses. How the Son of God could have been cursed with such a devilish case of BO has baffled religious scholars. The only logical explanation is that, similar to our inability to stare directly at God's brilliance, we are likewise compelled to avert our noses. Unfortunately, the Vatican's own innovative brand of Divine Deodorant, came far too late to help in this instance. Although it was of some use to coverup the stench produced by the Church's various molestation scandals. The scratch and sniff version of this painting repelled viewers of the 17th century. However, any publicity is good publicity and the initial infamy of this painting has led to it enduring through the ages.